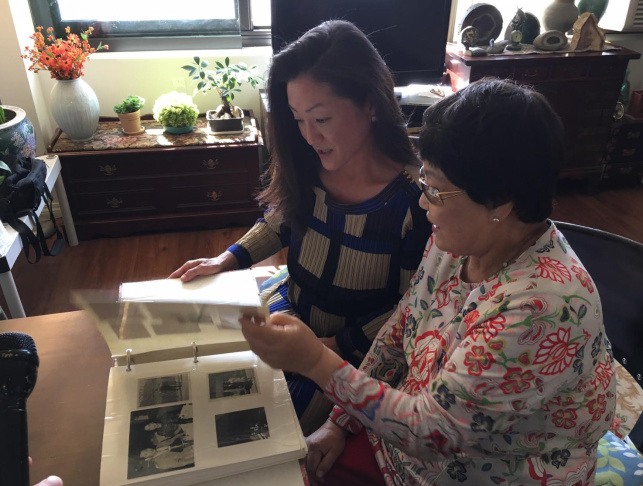 Jennifer Kang Erwood, left, and her mother, Kyung Kang, go through a family photo album. The family came to the United States after Kang was sponsored by her sister, who had married a U.S. soldier. 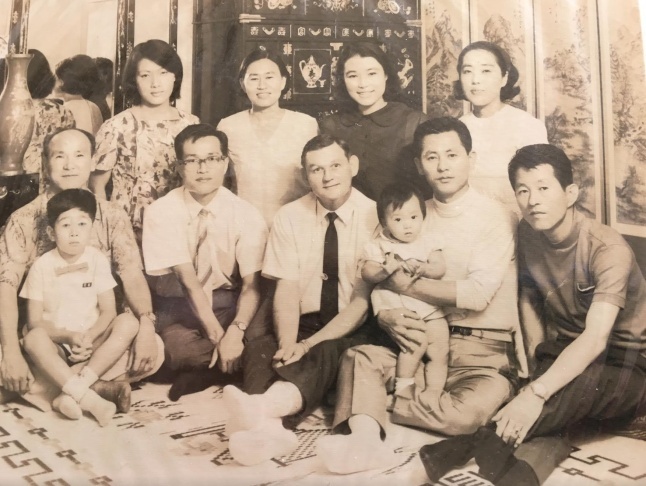 A photo from the late 1960s shows members of Kang family, some of whom came to the United States from South Korea after being sponsored by a sibling, a sister who married an American soldier and moved to the United States. Kyung Kang, left, and her daughter, Jennifer Kang Erwood, in Kang's Koreatown apartment. The family came to the United States after Kang was sponsored by her sister, who married a U.S. soldier. President Trump is backing a bill in Congress that, if adopted, would change the granting of entry visas from one focused on family members to that favoring people with sought-after job skills and university degrees. The proposed merit-based visa system is similar to those used in countries like Canada and Australia where applicants seeking to immigrate are awarded points that gives preference to skilled workers. The visa system in the United States is different. Immigrants who become citizens can petition to bring in family members, among them spouses, minor children, adult children, parents, and siblings. Legal residents without citizenship can sponsor their children and spouses. Under proposed legislation called the RAISE (Reforming American Immigration for Strong Employment) Act, family-sponsored visas would be eliminated, with the exception of those for spouses and minor children of citizens and legal residents. Significantly, the number of immigrant visas issued each year would be cut from about a million to half a million. For some immigrant families, talk of these possible changes and the current heated debate over immigration has had a chilling effect. Eighty-two-year-old Kyung Kang’s family migrated from South Korea to the U.S. over several decades. 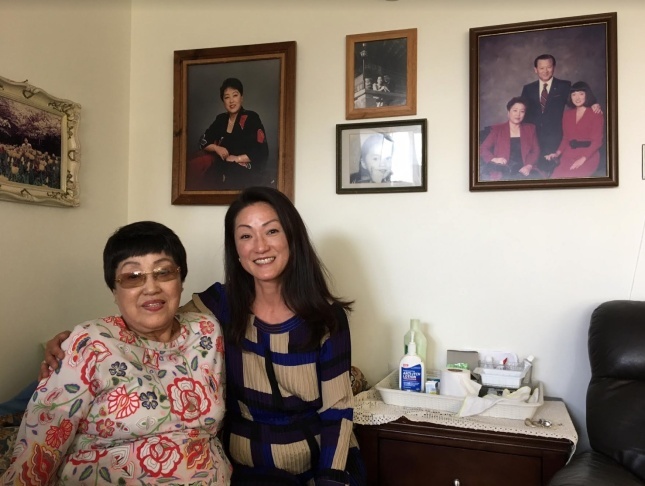 One recent afternoon in her Koreatown apartment, she described in Korean her family's immigration story and how it began when her young sister fell in love with a U.S. Army officer in the years following the Korean War. Kang's sister eventually moved to the U.S. as a military bride, "which was very, very frowned upon at the time," explained Kang's daughter, Jennifer Kang Erwood, who translated for her mother. Kang and her daughter paged through a meticulous collection of family photo albums, stopping on an old photo taken New Year's Day in Korea when Jennifer was two years old. “That’s me," Jennifer pointed out, "that is my father, that is my mother, that is my aunt, who fell in love with this white guy right here…those two." The newlyweds left for South Carolina, where they settled down. As soon as she could, Kang's sister sponsored her first relative, her younger brother. He found a job working in construction on the Alaska pipeline. Then Kang's sister sponsored Kang, Jennifer's mother. In 1977, Kang, her husband and then eight-year-old Jennifer arrived and joined her brother in Alaska. “My dad went to work the very next day after arriving in the United States, as a dishwasher for the airport cafeteria," Jennifer recalls. Her mother found work cleaning houses. It’s in this fashion that many new immigrant families got their start in this country. Since 1965, family-based migration has been the backbone of the U.S. immigration system. Those who favor the shift away from a family focus in granting visas say allowing people entry based on a merit system would be better for the country. “The whole idea of the RAISE Act is to benefit the United States, right?," said Steven Camarota, research director for the Center for Immigration Studies in Washington, D.C., a think tank that advocates for stricter immigration. 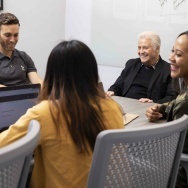 "So those highly-skilled people should have a positive effect on the economy and the high-skilled people should create a financial surplus, paying more in taxes,” Camarota said. Some economists argue it’s not that simple, however, and that family-based immigration provides its own economic benefits. “Whether they are consuming, whether they are taking care of families, whether having parents here allows skilled immigrants to stay in this country instead of having to go home – in many cases, you could still make an argument as to why bringing in all sorts of folks through immigration is a positive move," said Christopher Thornberg, an economist with the research firm Beacon Economics in Los Angeles. Highly skilled or not, immigrants who are working are contributing to the economy and paying taxes, he said. With that in mind, he said, cutting the number of legal entries in half could in turn affect the job market and have negative economic repercussions. Jennifer Kang Erwood said as her older family members arrived in United States, they did their part contributing to the economy. While her uncle and her parents worked blue-collar jobs, they saved, and sent their kids to college. 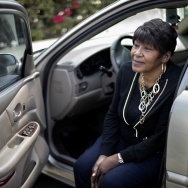 Her uncle invested his savings in fast-food franchises, she said, and now is a millionaire. Kang’s sister died some years ago. But Kang had hoped to bring over one last relative – an older daughter from Kang’s first marriage in Korea. Kang hoped her older daughter would help care for her in her aging years. But Kang is no longer hopeful. The RAISE Act has yet to be voted on, although one of the bill’s co-sponsors, Sen. Tom Cotton (R-Arkansas), recently suggested making it part of a legislative deal in exchange for granting legal status to young immigrants who arrived as minors.